Back in February I posted about people who claim to have seen visions of Jesus. The post was a short one, and general. I have now read some more on the subject, and I think it is worth outlining a couple of the stories. Gulshan Esther, a wealthy Pakistani Muslim, was crippled by typhoid from the age of 6 months. When she was 14, she travelled to a specialist in Britain, who told her she could not be cured, and recommended prayer. So she went immediately on a pilgrimage to Mecca, but was not cured. After he father died when she was 16, she had several visions of Jesus leading up to a visitation when she was 19 in which she was fully and instantly healed. She remained a Muslim, but began to read more about Jesus from within the Islamic faith. Eventually she converted to Christianity, was convicted under apostasy laws and forfeited her considerable inheritance, and went to live in England. You can check out her book or see her story on YouTube. Philip Wiebe is a Canadian Professor of Philosophy and Religious Studies who interviewed about thirty Canadians about the visions they had seen of Jesus. 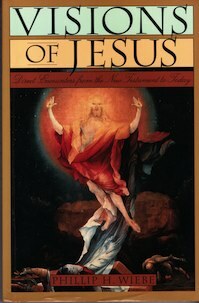 He has written up their stories in his book, Visions of Jesus, and analysed the possible explanations – supernatural, psychology or neurophysiology. He found no one explanation could be true for the diverse range of experiences. Barry Dyck was an 18 year old christian in British Columbia (Canada) in 1974 when he had a skiing accident that broke 3 vertebrae in his neck. In hospital, swelling caused his vision to become blurry, but the night before surgery was planned, he woke up to see Jesus at the foot of his bed. They conversed briefly, Barry touched Jesus’ hands, and Jesus said to him: Everything is going to be OK. The next morning Barry woke up with full vision and no pain. X-rays confirmed that there was now no fracture where there had been previously, and he was allowed to return home weeks earlier than expected and with no need for a neck brace. You can read Barry’s account of this experience here. At the very least, there is something interesting and powerful going on in these cases. If the experiences and the healings are imagined, they indicate an amazing and as yet untapped ability of the human mind. It is hard to believe all these stories are fakes or urban myths – few of the people reporting these visions had anything to gain from them, and many knew they would likely be ostracised and threatened for reporting them and (in some cases) converting to christianity. But if at least some of them were genuine visions, then many of us (both believers and unbelievers) may need to think again about God. It is hard not to see these experiences as evidence that God might indeed be communicating very directly to some people. If we value evidence, surely we cannot say with confidence that every last one of these stories has a natural explanation, so unbelievers with open minds might need to investigate some more. And that raises a whole lot more questions! Read more about the Muslim converts and Philip Wiebe’s interviewees at Visions of Jesus? on this website.